UPDATE: THE ABCF UPDATE/PLAIN WORDS IS NO LONGER BEING PUBLISHED. THIS PAGE IS HERE FOR HISTORICAL PURPOSES ONLY. 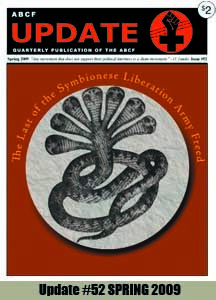 The ABCF has changed the name of its publication. Beginning in December 2009, the ABCF Update will be changed to Plain Words. 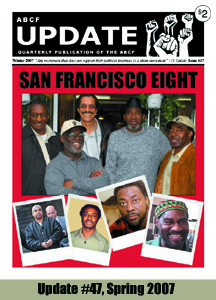 The ABCF Update/Plain Words is a quarterly publication that has been in print since 1995. 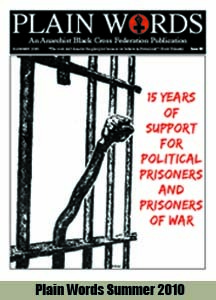 The magazine is used to promote and educate others about U.S. political prisoners and prisoners of war. 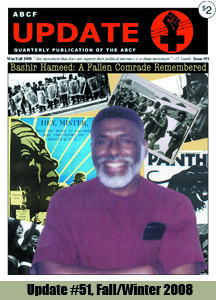 The Update/Plain Words usually contains articles written by or about PP/POWs and other issues relating to the political prisoner movement. You can download the illustrated ABCF Updates/Plain Words in pdf format by just clicking onto the images below. For all other back issues of the ABCF Update, please contact Los Angeles ABCF.